Just over a year ago in July 2017 iceberg A68 calved from the Larsen C Ice Shelf. I appeared on BBC News before it actually calved explaining what was happening. At first A68 was slow to move and as I predicted back then, it likely got stuck on the sea bed (we say "grounded"). It has stayed pretty much in the same place through to July 2018. But now A68 has started to swing northwards. As the light is coming back to Antarctica, at high latitudes visual imagery is very washed out. But if we look at other data such as the brightness temperature, you can see some striking features. This image is from 20 August 2018. Corrected Reflectance (True Color) from the Suomi NPP Visible Infrared Imaging Radiometer Suite (VIIRS), and the Brightness Temperature (Band I5, Day). Image from 20 August 2018. With the brightness temperature data set, brighter colours indicate higher temperatures. The Larsen Ice shelf and A68a are glacial ice and so cold, they appear dark purple. The sea ice is thinner and warmer and in contact with the ocean so the purple shade is lighter. The leads which are cracks in the sea ice and so open water and / or very thin sea ice appear as relatively bright lines. On the bottom right of that image you can see that under certain circumstances the brightness temperature data set can see through clouds. Posted in Science. 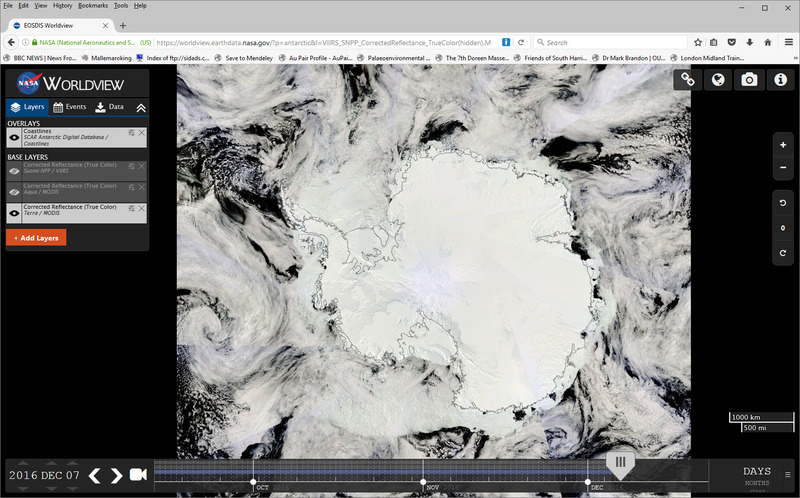 Tags: A68, antarctica, satellite, sea ice on August 31, 2018 by Mark Brandon. 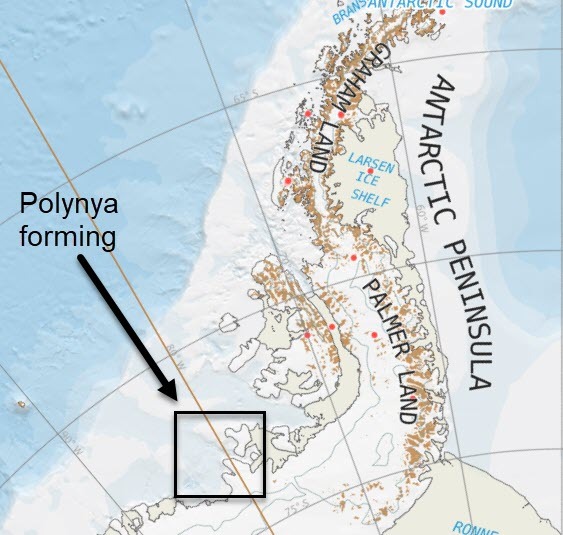 As daylight has returned to Antarctica it is straightforward to pick out polynya forming on the edge of the Antarctic continent. This one by the Stange Ice Shelf and Rydberg Peninsula caught my eye. 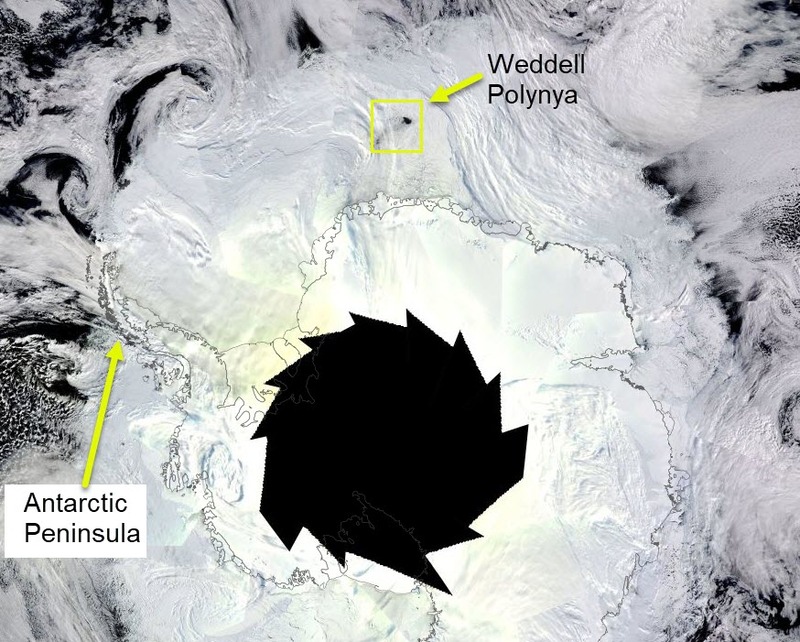 It is a latent heat polynya formed as the winds push the sea ice away from the land to reveal the ocean that appears black beneath. The wispy trails of grey which appear in the black are new sea ice forming as frazil ice. 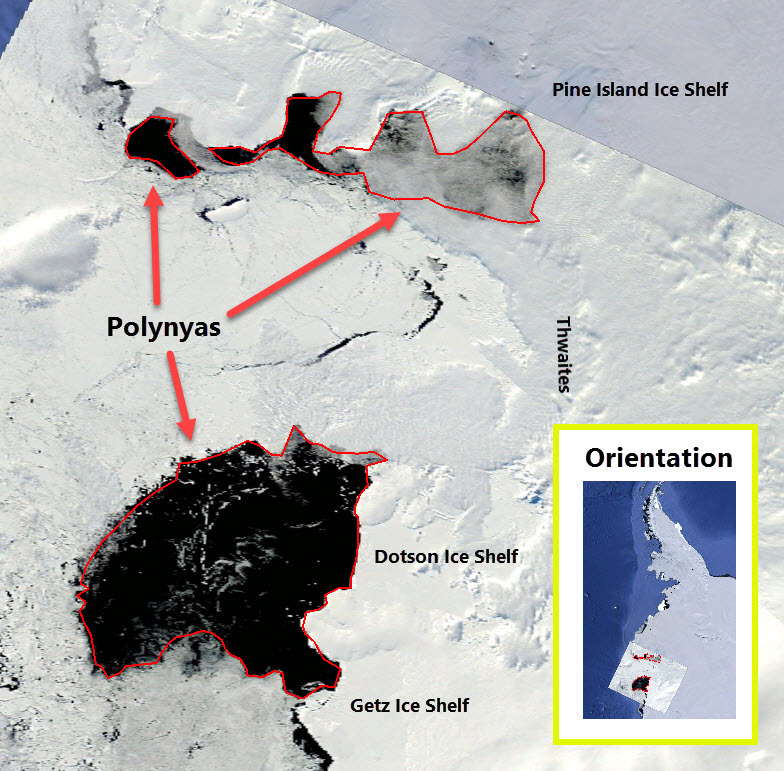 A latent heat polynya forming in front of the Rydberg Peninsula and Stange ice Shelf, 22-26 October 2017. This is the location of the peninsula. The location of the Rydberg Peninsula. I visited that area in 2007 and took this picture. You can a thin skim of young nilas ice in front of the ice shelf, and sea smoke too. 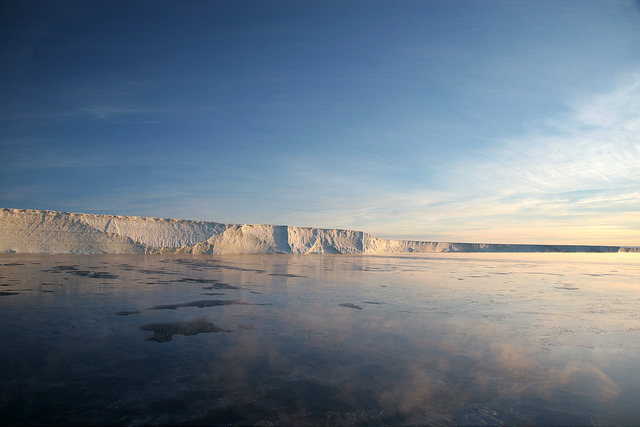 The Stange Ice Shelf with a thin skim of sea ice in front. Posted in Science. Tags: antarctica, frazil ice, polynya, Rydberg Peninsula, satellite, sea smoke, Stange Ice shelf on October 26, 2017 by Mark Brandon. Antarctic sea ice extent on 1 March for the years 1989, 1990, 1991, 1992, 1993, 1994, 1995 and 2017. Data from DMSP SMMI. The highlight issues in the graphic are the clear lack of sea ice in the Amundsen/Ross Seas and the Southern Ocean off Dronning Maud land. (If you are not familiar with the names off the seas / locations see the map below). 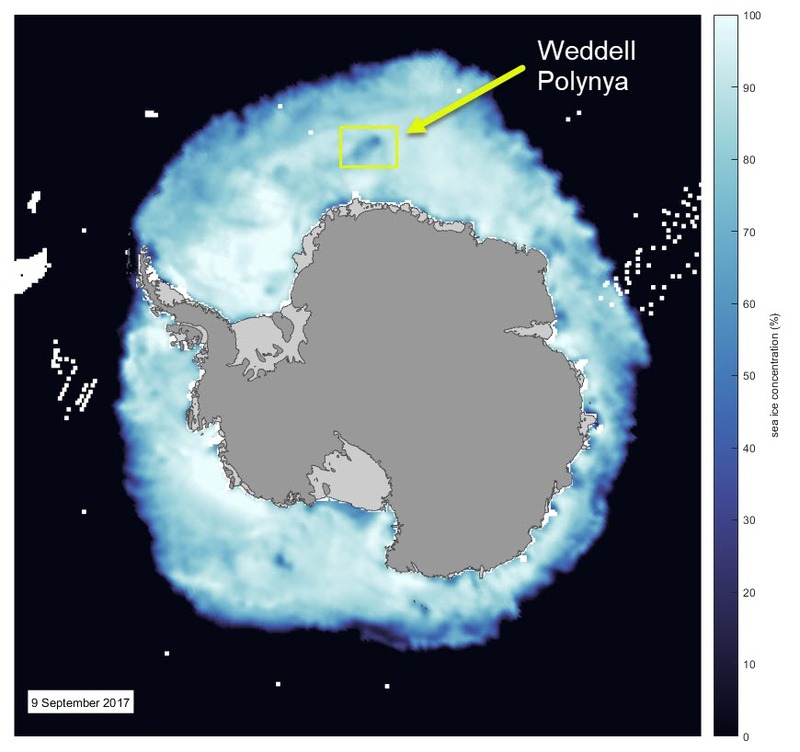 The Weddell Sea is has a relatively compressed sea ice cover this year - but it's clear there is large inter-annual variability. and the Russian Mirny Station. Here is the NSDIC Antarctic sea ice extent 1 March 2017. 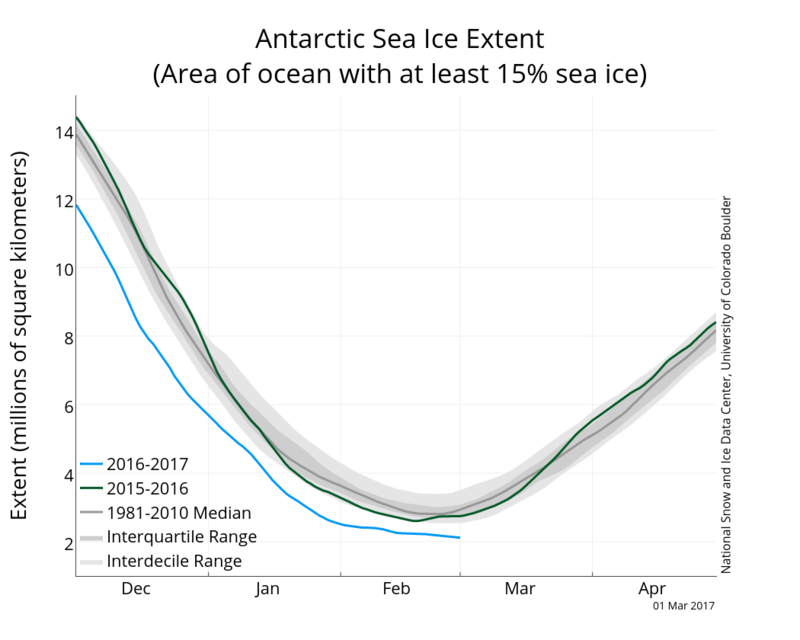 Antarctic sea ice extent (with greater >15% sea ice cover) 1 March 2017. From NSIDC. And finally the promised map from the National Snow and Ice Data Center (NSIDC) with regional seas and other features marked. 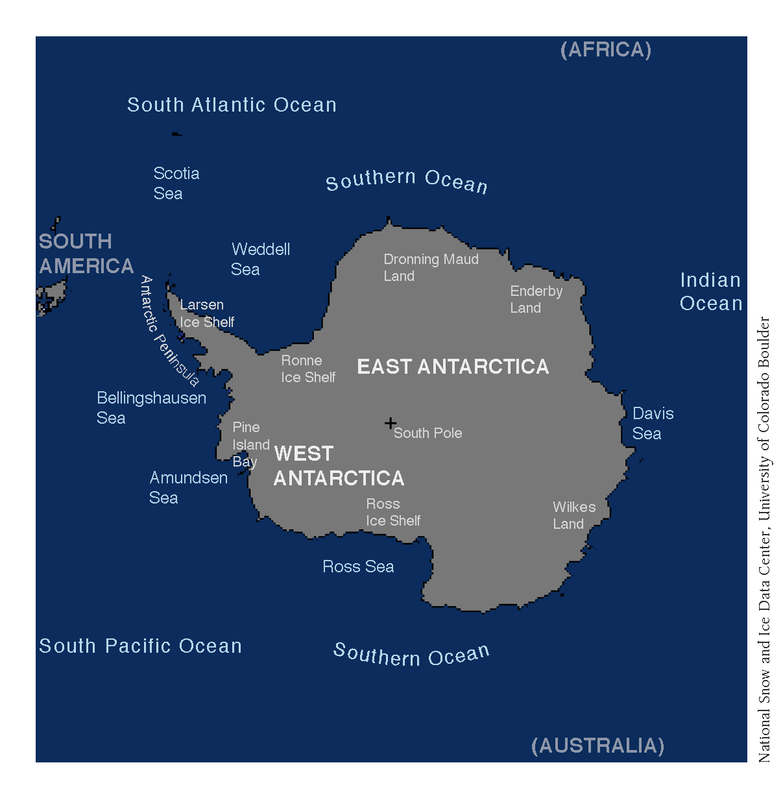 The oceans and regional seas around Antarctica, along with other geographical features. From NSIDC. Posted in Science. Tags: antarctica, satellite, sea ice extent on March 5, 2017 by Mark Brandon. I was asked “what is an easy way to get a satellite image into Google Earth?”. Once I explained how I do it I thought it may be of interest to others. 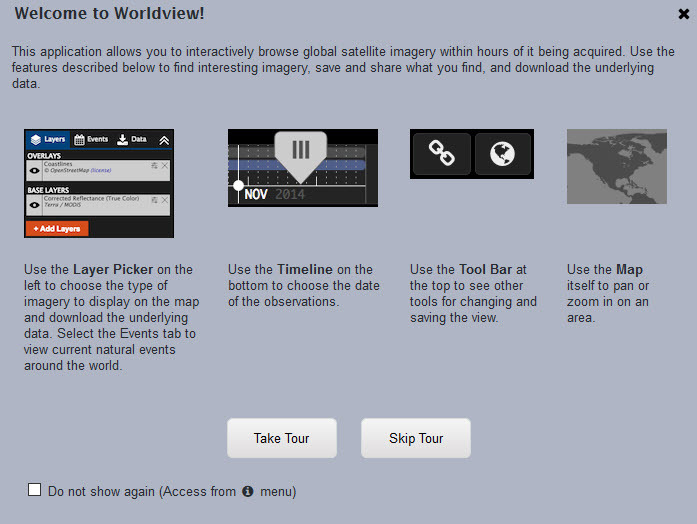 NASA have provided a really excellent web interface to some of their visual data called Worldview. The Worldview description puts into perspective how good it is. 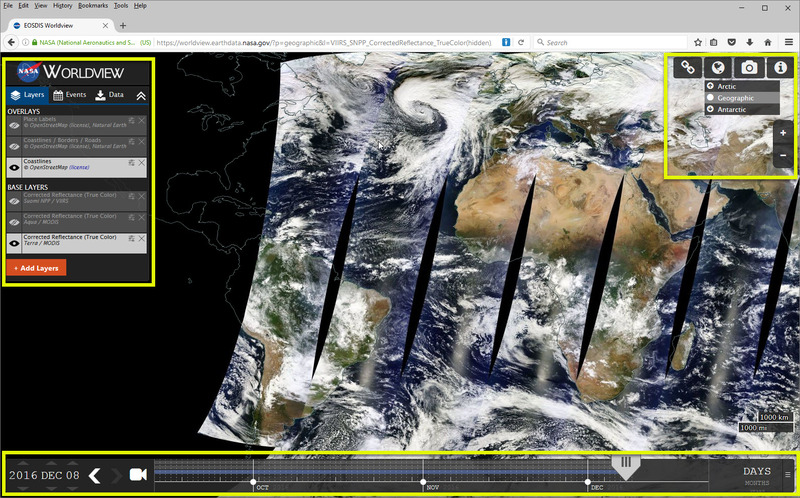 The Worldview tool from NASA's EOSDIS provides the capability to interactively browse global, full-resolution satellite imagery and then download the underlying data. 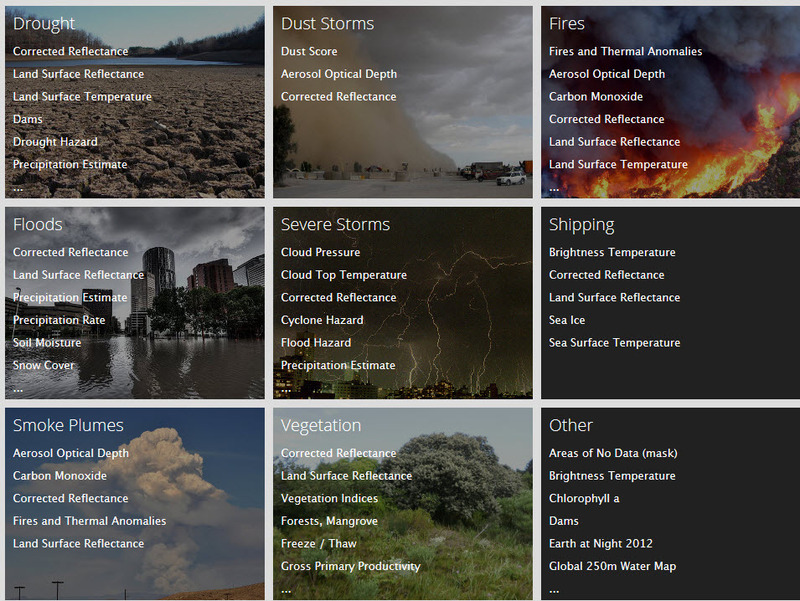 Most of the 200+ available products are updated within three hours of observation, essentially showing the entire Earth as it looks "right now"
Open worldview and this is the screen you are greeted with. It is easy to use. The key regions are the projection / copy / link tool in the yellow square on the right, the date control in the yellow box on the bottom of the browser screen and the layers control in the yellow box on the left. I do recommend following the tour to find your way around the data sets. If you click the layers button (red on the left) this is just a part of the choice of real time data you can easily access. This movie I made shows how you can get imagery from Worldview easily into Google Earth. I hope you find this useful. It's easy to spend a lot of time looking at this data. Posted in Science. Tags: MODIS, satellite, Worldview, youtube on December 8, 2016 by Mark Brandon. This is the the full years data to 21 November for the anomalies of the sea ice extent in 2016. See my blog post Antarctic sea ice 2016: Historic lows for full context. The plot shows the difference between the daily ice extent, in each grid cell, for the year to 21 November 2016, and the mean, for each day, based on historical data for the 5 year period 1989-93. 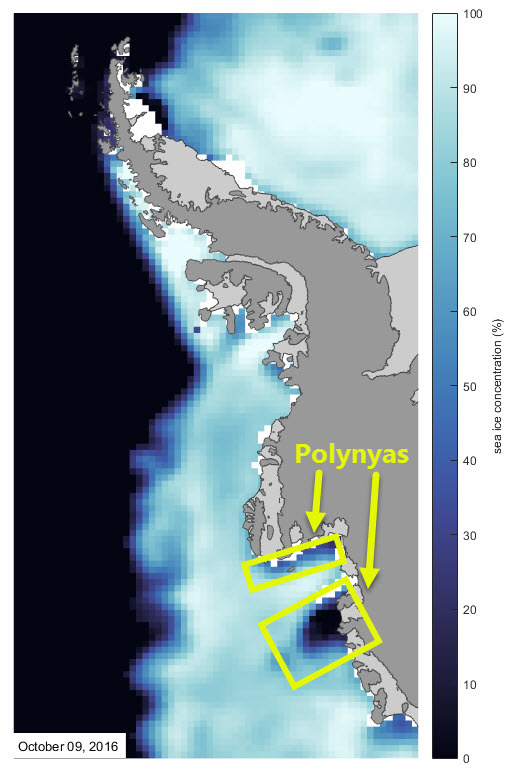 Blue shades imply more sea ice and reds imply decreased sea ice compared with the mean. The five year average sea ice extent (1989-93) - the extent for the same day in 2016. Red colours indicate less sea ice than the 5 year mean. To make the plot for each day of the year and each grid cell I worked out the mean sea ice extent for 5-year period 1989-1993. I then used this calculated mean taken away from the 2016 data for the same day to derive the anomaly maps. For example if the plot shows very dark blue that means that there is 100% sea ice cover in that grid cell in 2016 and none in the 1989-93 mean. A dark red means there is no sea ice in 2016 where we would expect 100% sea ice cover. The original data come from the DMSP SMMI data set at the NSIDC. Posted in Science. Tags: Antarctic, satellite, sea ice extent on November 24, 2016 by Mark Brandon. The seasonal cycle of sea ice extent in Antarctica has been fairly stable over the length of the satellite record. There is a slow growth of sea ice from a minimum of ~3x106 km2 in February to a maximum of ~19 x106km2 in September, before there is a relatively rapid fall in the Antarctic spring. But this year something different is happening. Below is Tamino's image for the Southern Hemisphere sea ice extent, the red line is 2016 up to 16 November 2016. The annotated seasonal extent of sea ice in the Southern hemisphere. From Tamino's post Sea Ice, North and South. From January up to September the sea ice extent in 2016 follows all previous data. But what happened in September? Posted in Science. Tags: Antarctic, antarctica, satellite, sea ice, sea ice extent on November 24, 2016 by Mark Brandon. It is October and it is the Arctic sea ice growing season. 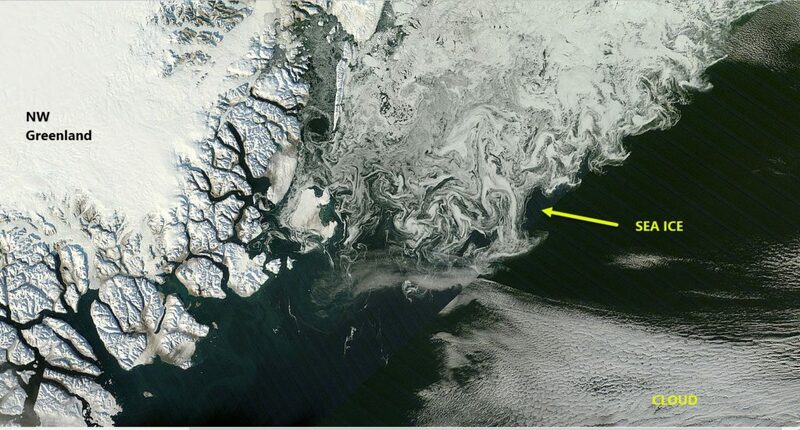 The MODIS imagery yesterday shows this beautiful image of sea ice on the North East Greenland coast. Posted in Science. Tags: Arctic, Greenland, MODIS, Nansen, satellite, sea ice, transpolar drift stream on October 7, 2016 by Mark Brandon.